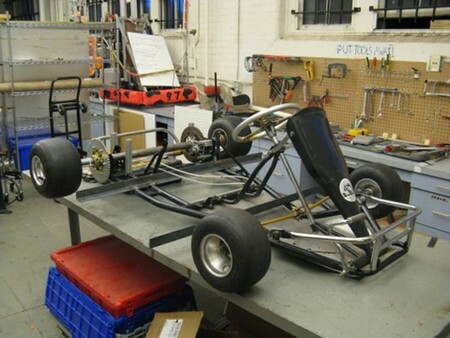 Building a custom designed go kart frame can be a great family project. The whole family can build the go kart frame using metal tubing or angled iron. The satisfaction of creating something that a person can drive is incredible. Here are some steps you can take to make the dream of making a go kart come true. Sit yourself or a family member down on the floor. 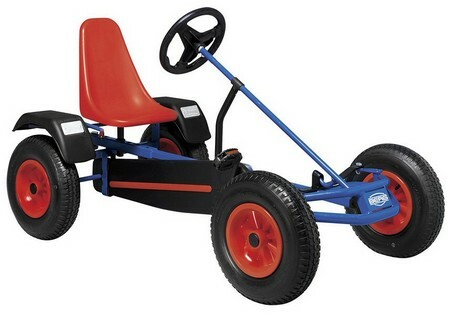 Envision yourself in the go kart. Use chalk to draw measurements that are comfortable for the person. As a general rule, go kart frames have a width of 1/3 to 2/3 two the size of the frame at the wheel base. This is accommodate two riders. A wider wheel base also makes for a more stable go kart frame. Use a chop saw to cut the metal tubing to size. Then, lay out the frame and note the progress and how it looks. Saw the round tubing until it is flat. Then connect round to square by welding. You can heat the round material and hammer it flat as an alternative. You need to install a roll bar in the front of the driver’s position and over the driver’s head. This roll bar is a protective element and can prevent injury if an accident were to occur. Customize the seating arrangement and your go kart frame. Make sure the seating isn’t more than 2 inches from the ground. This also prevents the go kart from flipping over. Now, you need to form the go kart frame. Using angle iron for the entire frame is optimal. However, you may use angle iron solely for the parts of your go kart that need bent angles. Create the basis of your frame using step 1. Now, saw off one side of the iron. Heat the iron and bend it as necessary for a finished look. After you have the shape you desire, weld the iron by heating it and bending it. Also, reinforce the frame will filling material. Use Harbor Freight pipe bender to further customize and bend your go kart frame.